Pharmacists are integral members of the healthcare team and play a vital role in seniors’ care. They are readily accessible to offer advice and information about medications, monitor their use, and liaise with physicians and other healthcare providers to manage and improve drug therapy and enhance their patients’quality of life. Their expertise is vital to seniors who generally take more prescription drugs than younger people, which increases the risk of adverse effects and drug interactions. According to Statistics Canada, 76% of seniors living at home and 97% of residents in healthcare institutions take some form of medication. The use of multiple medications increases with age due to chronic conditions. Two-thirds of Canadians over 65 have five or more different prescriptions, and one-quarter have 10 or more. 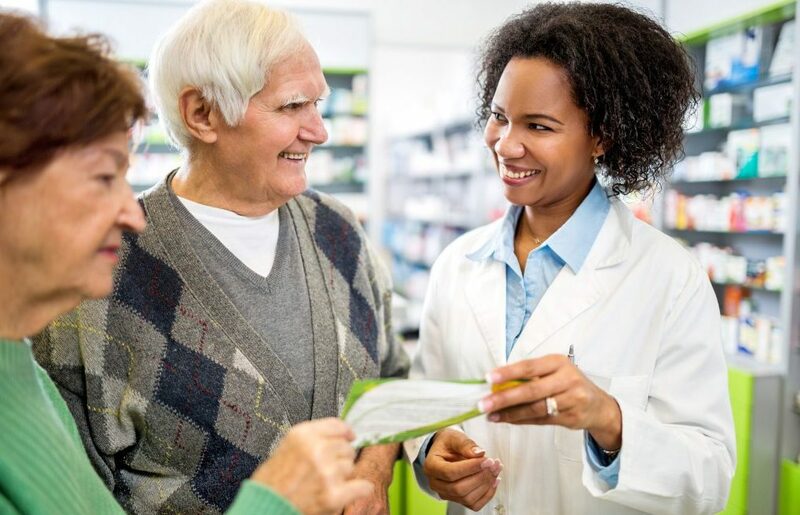 “When provided with the right information, pharmacists can help ensure that seniors get the most benefit from the medications prescribed to optimize their health,” says Sherif Bakhoum, Director of National Pharmacy Operations at Bayshore HealthCare. Try to fill all your prescriptions at the same pharmacy. That way, the pharmacist can check to see if there is a potential for hazardous drug combinations. You can also ask your pharmacist to review all your medications and assess if some may no longer be beneficial. Anyone who takes several prescription medications for chronic conditions or anyone who has been diagnosed with diabetes may be eligible for a comprehensive medication review covered by the Ministry of Health in your province. During this review, the pharmacist can also assess the use of devices such as inhalers, injections and glucose monitors. A summary of your medication review will also be sent to your doctor along with any recommendations the pharmacist may provide. According to a report by the Canadian Pharmacists Association, when patients had medication reviews with their pharmacists, those managing blood pressure were 3.5 times more likely to attain target levels and those managing cholesterol levels were 2.3 times more likely to attain target levels. In the Express Scripts Drug Trend Report 2016, case studies indicate that patients with chronic conditions may have multiple medications aimed at treating one condition and would likely benefit from clinical advice. This is common with blood pressure, diabetes and cholesterol medications. Patients on specialty medications (used to treat complex or rare conditions such as cancer, rheumatoid arthritis, multiple sclerosis and hepatitis ) and with chronic conditions likely need some kind of consolidation of clinical advice, especially to review adverse events and drug-drug interactions. It is also extremely important to advise your pharmacist if you are taking any non-prescription drugs, herbal remedies or vitamin and mineral supplements because they have the potential to interact with medications and negatively impact their effectiveness. Should I take the drug with food or on an empty stomach? Can I stop taking a medication for any reason? If you’ve been in the hospital, it’s possible your medications may have changed. Let your pharmacist know if you have any new medications and if any of your previous prescription or non-prescription drugs, vitamins or herbal remedies have been changed or discontinued. Pharmacists in most provinces can now give you the flu vaccine. All you have to do is walk in during business hours. It is provided free-of-charge to people 65 and over across Canada and does not require a prescription. Pharmacists may also be able to give you travel vaccines such as typhoid, yellow fever, hepatitis A and B, as well as vaccines for shingles and tetanus. Some vaccines require a prescription from your doctor. Check with your pharmacist. It is often difficult to read the print on pill bottles and packages. You can ask your pharmacist for larger print on labels and take-home instructions. If you have trouble getting the lid off pill bottles, ask for containers that are easier to open. If English is not your first language, ask if you can get instructions in your language of choice. Sometimes pills aren’t available in a small dosage and require splitting. You can ask the pharmacy staff to split the pills for you. Rather than trying to keep track of multiple medications and when to take them, ask for pre-packaged doses in blister packs which are arranged by days of the week and time of day. You can also purchase a weekly pill organizer called a dossette. Check the expiry date on all your medications, herbal remedies and vitamins. Take expired meds back to the pharmacy for safe disposal. Ask your pharmacy if they deliver for people who have mobility issues. Your pharmacy can enroll you in refill reminders so you don’t run out of medications. Bayshore pharmacy home care services include medication management, medication reviews and medication reminders. For patients on specialty medications, our pharmacists are trained on the disease states that the drugs are intended to treat, and have facilities to manage, store and prepare specialty medications, which usually require special handling and/or preparation. We also offer infusion pumps for loan for some medications that may be infused at home and compounding services to encourage adherence. Call us at 1-877-289-3997 or email clientservice@bayshore.ca to learn more. For more information about diabetes products and care, please visit our Diabetes Express™ website [www.diabetesexpress.ca] or call 1-866-418-3392.